Established since 2005, eHealth Consortium ("eHC") is one of the major non-profit making organizations in Hong Kong leading eHealth advocacy in the region and we are the prime agency bridging healthcare and IT industries to advance the development of eHealth in Hong Kong and Mainland China. Over the years, our efforts are focused on three key areas, namely data standardization, education and capacity building, and facilitating pilot projects for the advancement of eHealth applications. We work closely with the healthcare and the ICT sectors to offer training programs, conferences, and seminal events for eHealth stakeholders. 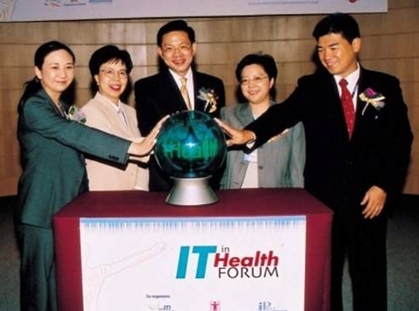 The most notable were the eHealth Forum, which brought together more than 500 delegates in 2006 and 700 delegates in 2009 ranging from national policy makers, professionals from healthcare and health informatics industries, as well as ICT industry players from Mainland China, North America, Europe, and countries in the Asian Region. Our vision is to create a well-integrated environment where the public health and patient information can be readily shared between the public and private sectors for the enhancement of the accessibility, quality and effectiveness of healthcare services in Hong Kong. - Bring IT and healthcare professionals together to facilitate and promote the use of IT as a key enabler in the healthcare industry. We believe that the quality, accessibility and effectiveness of healthcare services would be enhanced via the use of ICT. The eHC Limited shall be the platform to bring together policy makers, the professionals of related fields, as well as the stakeholders from the community, to advise and promote the use of ICT in achieving the goal of providing better healthcare services to our society. * To facilitate and promote the adoption of a territory-wide eHR system. * To provide education and training to healthcare & IT professionals on advanced eHealth technology & applications. * To facilitate the implementation of pilot projects for eHealth implementation. * To facilitate the advancement and acceptance of world-wide standard in eHealth. In 2003, Hong Kong was hit hard by SARS, an unknown infectious disease that threatens the life of Hong Kong people. Against such a backdrop, the Internet Professional Association (iProA) and the Department of Health jointly organised the "IT in Health Forum" in July 2003 under the initiatives of "DO IT Campaign" of the Legislative Councillor Hon. Mr. SIN Chung Kai. This forum provided a platform for knowledge and experience exchange among IT and health professionals in the areas of disease tracking and control. One of the highlights of the event was the publication of the "White Paper: The IT Infrastructure of Hong Kong's Centre for Disease Control (CDC)", which pinpointed the importance of data sharing and development of local expertise in public health informatics, and aroused much professional interest in the subject. Subsequent implementation of the "Communicable Disease Information System" for disease surveillance by the Hong Kong SAR Government is crucial to Hong Kong in view of the threat of the avian flu. Recognizing the important role of information and communication technologies in support of health care, the Fifty-Eight World Health Assembly called on its member states to implement plans for eHealth services for cost effective health administration, to mobilize multi-sectoral collaboration for determining evidence-based eHealth standards and norms, and electronic public health information systems for surveillance of and rapid response to disease and public-health emergencies. To further capitalize on awareness generated in 2003, to further promote the use of IT in the health care industry, to move forward with important recommendations of the White Paper and to raise public awareness to the call of the Fifty-Eighth World Health Assembly, Internet Professional Association (iProA) and Hong Kong Society of Medical Informatics (HKSMI) came together and founded the eHealth Consortium organization with supports from the Hospital Authority, the Department of Health and the Office of the Government Chief Information Officer. 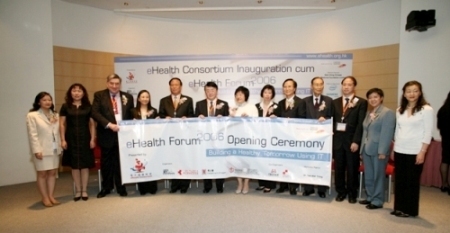 eHealth Consortium was established by such public-private-partnership which aims to promote collaboration between health care and IT professionals in both private and public sectors for health care services with enhanced accessibility, quality and effectiveness for a healthier tomorrow for everyone in Hong Kong. We invite all health care and IT professionals in Hong Kong to take part in this effort. We believe that through public-private-partnership and co-operation between health care and IT professionals, we will be "Building a Healthy Tomorrow" for the people of Hong Kong as envisioned in the Hong Kong SAR government's recent consultation paper on health care reform. All member organizations that are interested to contribute to the initiatives of the eHC Limited can nominate a representative to join the Board as well as its sub-committees. The Board shall convene 3-4 times a year to take forward the directions and initiatives set out by the Steering Committee and report progress to the eHC Limited. Mr Eldon YEUNG - Board Member, Hong Kong Public Key Infrastructure Forum Ltd.
Mr Timothy MA, JP - Chief Consultant, Ma Kam Wah & Co.